With his latest film “Dunkirk,” Christopher Nolan is yet again attracting rave reviews in China. As of Sunday, its third day of public screening in the Chinese mainland, the film had already raked in over 197 million yuan (US$30.1 million). 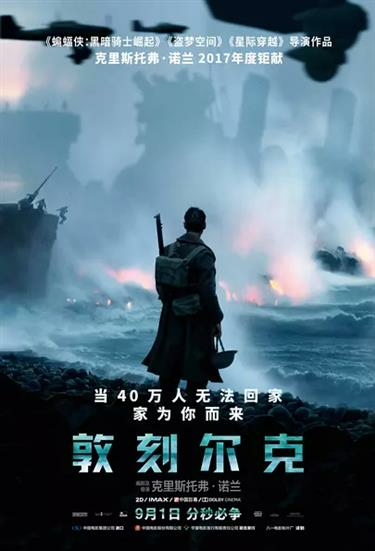 On Douban, a film ratings platform, “Dunkirk” is currently rated 8.6 out of 10, sitting comfortably in the top 10 percent of both war and history films. “I went to see the film because of Nolan,” said moviegoer Huang Ziyun. “His films have always delivered, so I had faith and high expectations in this one. “I’m also very interested in films that depict history,” she said. The film did not disappoint. Telling the story of the evacuation of British and French soldiers who were surrounded by the German army during a fierce battle in World War II, Dunkirk puts the audience through an immersive experience that many have found overwhelming. “There were many scenes that imposed an oppressive feeling on me, such as the scene where a number of young soldiers hid in a cabin which became the target for German soldiers’ shooting drill,” said Shen Cong, a viewer in Beijing. The film depicts a week for the soldiers desperately waiting to be rescued, a day for a family sailing from England to help in the rescue, and an hour for a group of fighter pilots shielding the rescue efforts from the air. Each storyline intertwines and eventually converged. Their words echoed those of Nolan himself in an interview last month. “This story is about suspense. Suspense is a cinematic language where you can’t take your eyes off the screen,” he said. “Time in any film is a very interesting tool for filmmakers to use,” he added. For viewers, his take on time and suspense is only enhanced by the ear-scratching and tension-building music produced by German composer Hans Zimmer. “The soundtrack is the most significant source for an immersive experience,” Huang said, highlighting the role of the sounds in captivating the movie audience. That’s part of why a lot of viewers are confident the film will continue to attract Chinese moviegoers, even though the subject matter doesn’t directly relate to Chinese history. Others simply took it as a call for peace. “Just take it as an anti-war story to follow, and you’ll be touched as I was,” said Mao Zhuxin, a movie fan from southwest China’s Chongqing. “May peace prevail on earth,” she continued.